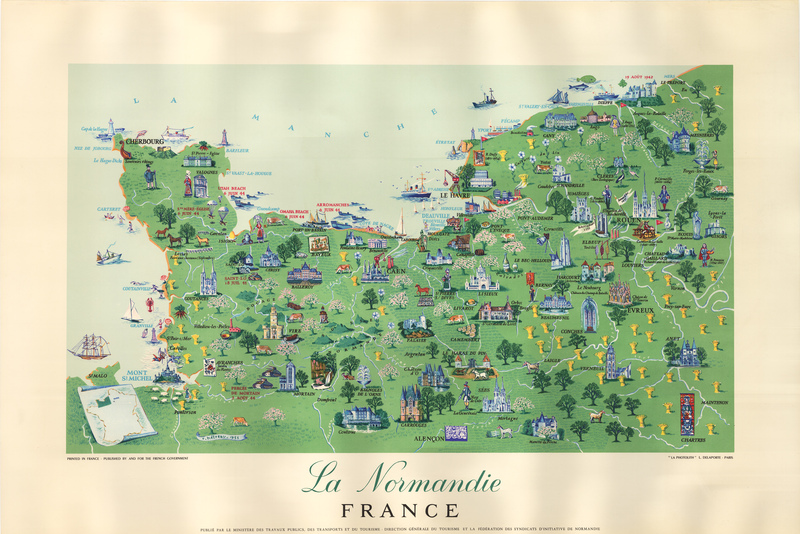 This lovely vintage poster of the French region of Normandy aptly demonstrates why the work of Hetreau was described by friends as being beautiful and true as a garden in May, and that whoever sees it will be made happy. Lovely tones of green show us that the British Isles do not have a monopoly on green vistas. The entire region of Normandy is depicted here with myriad churches and cathedrals, castles, chateaux and palaces, farm animals and wildlife, industry and agriculture. The poster imbues the beholder with a sense of serene calm and prosperity. In the sky above Mont St Michel St George and the dragon are depicted. Throughout the map is peopled by figures ancient and modern and in-between, historical figures and peasants and tourists. The compulsory tanks are the only reminder of what took place in the decade before this poster was created. While not as colorful as many of his works, this poster distinguishes itself by the pleasant imagery and sense of peace it evokes. Condition: This lovely linen-backed vintage poster is in A+ condition.